The Asian theme continues on gourmet cubicle. After the success of my Japanese miso ramen recipe, it’s time for another Asian staple: Chinese dumplings, also known as jiaozi. For a very long time the idea of making dumplings never really crossed my mind, mostly because I had a preconceived idea that they must be really difficult to make. Then I talked to my friend Minghui. I knew his family cooked, because he brought amazing dishes to work potlucks in the past. I told him about Cooking with Friends and asked him if he would teach me to cook a Chinese staple dish. He said yes, without thinking twice. When Chinese New Year rolled around, Minghiu invited me to celebrate with his friends and learn the secrets of making dumplings with his friend Kitty. He told me that they’d make traditional Chinese dishes, and that Kitty–Minghui’s good friend and neighbor—would show me the secrets to her famous dumplings. I was blown away (and a bit nervous) about making dumplings from scratch. Kitty’s mom, Lanxiang Yang, who was visiting from China, would be there as well, and according to Minghiu, she had mad dumpling-folding skills. When I arrived at Mighui’s house, I was welcomed by his wife Jun Li, his super cute daughter Jennifer, Kitty, and Lanxiang. They were excited to share their recipe and traditions with me. Lanxiang was wearing traditional Chinese clothing, which set a celebratory tone. Even though she didn’t speak English at all, we were able to communicate with Kitty’s help and through signs. Lanxiang started by showing me how to make the dough. The ingredients were simple—water, flour, and salt—but the process was time-consuming and rather difficult. When I tried my hand on rolling out a wrapper, it was obvious to everyone that I wasn’t meant for this; the wrappers were all wonky and pretty much useless. Of course, Kitty and Lanxiang kneaded, cut, and rolled the wrappers so fast that it looked effortless, but that was just the result of years and years of experience. As a result, in my recipe, I recommend you buying the pre-packed wrappers to make your life a lot easier. While I was observing the whole process, Kitty told me about a few Chinese gastronomical traditions. I found that these dumplings are specific to the northern part of China and that Shanghai also has a variation of them, but they are sweeter. I also found out that eating in Chinese culture is similar to many other cultures in that it is communal. They usually set up two tables: one for adults and another for children. On special occasions like holidays, anniversaries, birthdays, etc., they make dumpling along with a lot of other dishes. The rule of thumb is to make 10 dumplings per person, which adds up pretty quickly for a party of 15-20 people. I also learned about the importance of the number 8 in Chinese culture. When hosting a dinner or family gathering, they start the feast by serving 8 cold appetizers (cured meats, salads, noodles, etc) followed by 8 warm plates (fish, dumplings, cumin lamb, double fried pork, etc.). The meal ends with fruits. Generally, the women are responsible for cooking and the men are in charge of cleaning. Although some men take pride in their cooking skills, Minghui was as much a novice dumpling maker as I was. We used the rule of 10 and determined that we needed to fold at least 130 dumplings. Lanxiang showed us at least four or five folding techniques, but they didn’t really stick to Lianxiang's amusement. She could pick up a wrapper that Kitty rolled out, put a spoonful of filling in the middle, and just like when a magician performs a trick, BAM! You got yourself a dumpling. Half an hour later, Lanxiang, Minghui, and I finished folding 147 dumplings (yes, I did count them all). Minghui and I contributed very little to the total number, as we were only able to successfully fold 10 to 15 in that time. The rest were all Lanxiang’s work of magic. Her hands were on autopilot, moving faster than a high-end folding machine, and she laughed all the while at Minghui’s and my inability to master dumpling folding. After a few weeks I decided to try making them at home, and although it took me about an hour to make 30 dumplings, they were well worth it. My friend Maria (who you may remember from a previous Cooking with friends blog post) swears by them. She claims that these are the best dumplings she’s ever had, which means a lot, since she’s spend significant time in China. Try them, have fun with the folding, and don’t make a big deal out of the shape—they’ll taste fantastic regardless. Enjoy! Start with the dipping sauce. In a small bowl, combine the soy sauce with the vinegar, garlic, ginger, and chili oil. Stir and set aside. Coarsely chop the celery, green onions, and ginger, and then transfer them to a food processor. Pulse until they are finely chopped. Don’t overdo it! Remove the celery mix, wrap it in a clean kitchen towel, and squeeze it to remove the excess liquid. In a large bowl, combine the ground pork with the finely chopped celery mix, salt, white pepper, Sichuan pepper, and olive oil. Using your hands, stir until the filling is well mixed. Holding a dumpling wrapper flat in your hand, place 1 ½ teaspoons of the filling in the center of the wrapper. Wet the edges of the wrapper and fold the dumpling in half to form a half-moon shape, pressing out the air as you seal the dumpling. Bring a large pot of water to a boil over high heat. Add the 15-20 dumplings at a time and cook until they float to the surface or until the water starts foaming. Add half cup cold water, and wait until the water returns to a boil. Add another half cup cold water and cook until the water starts boiling again. Using a slotted spoon, remove the dumplings and transfer them to a platter. Repeat until you boiled all the dumplings. Serve the dumplings hot, with the sauce on the side. There are several techniques to fold the dumplings. Look one up on YouTube if the instructions aren’t clear. Don’t sweat too much over making them look like at the restaurant—those guys are pros. It’s Cooking with friends time again, folks! I know it’s been a while since my last blog post, but I’ve been making some changes in my life lately, which have kept me busy both in and out of the kitchen. I recently started taking photography classes, and it feels oddly satisfying to go to school and do homework again. I’m also dedicating more time to recipe development and photography. Writing, on the other hand, has been really tough. I found myself on a dry spell lately, but I’m hoping that my upcoming Chilean journey and backpacking trip through Patagonia will take care of that. With all these new things happening in my life, I really value the timeless tradition of communal cooking. Friends, food and drinks always make me realize how lucky I am. Speaking of amazing friends, you probably remember Ame and Hanna from one of my older blog posts. They are back with yet another amazing Ethiopian staple: Beef Tibs. 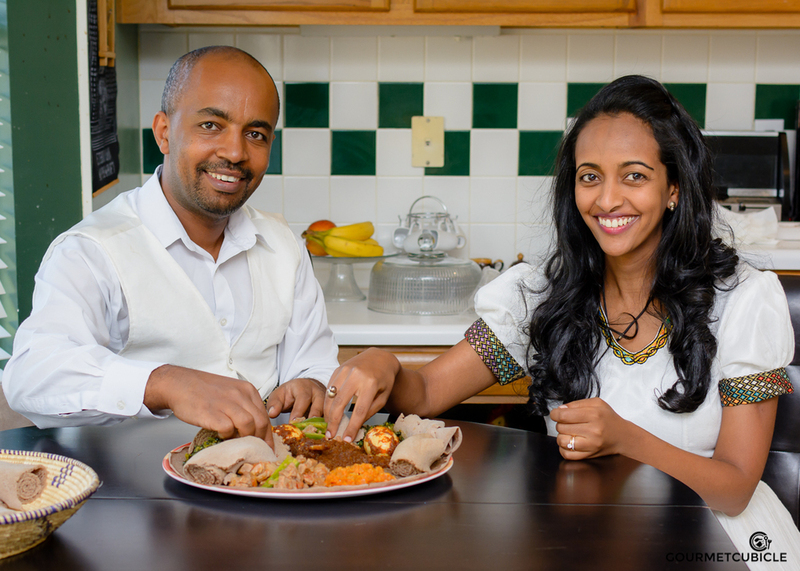 Ame and Hanna are a well-respected and highly regarded couple in the Ethiopian community, and they were some of my first friends to feature on the blog with their delicious Ethiopian Lentils also known as Misir Wot. The post was a total success and is still one of the most visited blog posts in the life of gourmetcubicle to date. The best part was that people from the Ethiopian community reached out to me via email, commending the recipe and giving me props for the way I portrayed Ethiopian cuisine and traditions in the few lines I wrote. There was one funny incident during the last blog post with Ame and Hanna. Whenever I write a Cooking with friends post, I don’t let my friends see the story until it goes live. It allows me to be honest about how I feel about their culture, our friendship and, of course, the food we are cooking. Putting those thoughts on paper is my way of saying thank you for the time and effort they spend on sharing their knowledge with me. Not everyone reacts the same way to what I write though. Guy thought my portrayal of him as a stubborn perfectionist was hilarious, while Maria felt a tug at her heartstrings because of my comments on our friendship. With Ame, though, it was a completely different experience. As soon as the blog post went live, Ame told me that the title should be changed. The TITLE? The recipe was initially named Ame’s Ethiopian Lentils (Misir Wot), which was completely wrong, because the recipe belonged to Hanna. He felt like it would be unfair to take credit for his wife’s recipe. I immediately changed it to Ame and Hanna’s Ethiopian Lentils, even though a few people had already shared the recipe on social media. “I should’ve known better than that!” I thought to myself. I’m familiar with Ame’s perfectionist personality. As a matter of fact, I’m in touch with that emotion - I’m an engineer, too. Although both Hanna and Ame are great cooks, Hanna has that special talent of making everything related to cooking look easy. She’s always calm and in control of the situation. While she was cooking, measuring, and introducing me to the secrets of Ethiopian cuisine, Hanna was also talking to Ame and looking after Nathan, the youngest of their 3 little munchkins. She told me about the importance of berbere - a medley of chili, garlic, ginger, ajwain and a few other spices, and how this spice defines their cuisine. Misir wot (Ethiopian lentils), Doro wot (Ethiopian chicken stew), Gomen (Ethiopian collard greens) and Beef Tibs were all served on a perfectly plated injera bread. Although all the dishes prepared by Hanna and Ame were excellent, I found the beef tibs to be my personal favorite. Initially Ame and Hanna taught me a recipe that wasn’t using berbere. The flavors were good and balanced, but the addition of berbere made the gravy more flavorful and richer. It’s my preferred way of eating beef tibs because even after I run out of meat, I can dip the injera in the gravy. Enjoy! In a nonstick skillet heat oil over high heat. When the oil easily slides across the pan, add the onions and garlic. Cook for about 4 minutes until the onions become translucent. Stir often so the garlic doesn’t burn. Add tomatoes and cook for another 3 minutes, stirring occasionally. Sprinkle with berbere and 2 tablespoons of water reduce the heat to medium-high and cook for 5 more minutes, stirring often. Add beef and mix well until the meat cubes are well coated with gravy. Reduce the heat to medium and cook for 15-20 minutes or until the meat is well cooked.If the gravy is too thick you can add another tablespoon of water. Add salt, jalapenos, and rosemary. Give it a last stir and let it cook for 3 more minutes. Taste and adjust seasoning. If the gravy isn't spicy enough you can add more berbere. Serve beef tibs on injera bread with a side of Misir Wot (Ethiopian lentils) and gomen (Ethiopian collard greens – coming soon). The heat level of the dish is dependent on the amount of berbere you add. For a milder version reduce the amount to 1 tablespoon. For extra spicy double the amount of berbere and don't completely remove the seeds from the jalapeños. “Cooking with friends” blog posts are quickly turning into one of my favorite activities. It’s so refreshing and exciting for me to go into my friends’ kitchens and cook with them! Each experience is unique, and I’m able to discover a side of my friends that I wouldn’t otherwise have the chance to see. Some are strict recipe followers, and some are improvising adventurers. Seeing the way they work in the kitchen and learning from them while they tell me their stories always fills me with joy and gratitude. Add a drink into the mix and it feels like all your problems have melted away. Friends, food and drinks connect people from all backgrounds and walks of life, and through them, many of the world’s problems are solvable. Maria is one of those friends who’s always been there for me. Whether she’s taking care of my dog, Popsi, while I’m away travelling, giving me advice during hard times, or just listening to me, she never disappoints. I’ve known Maria since I lived in Hungary but we became close friends once we each transferred to Austin with our jobs. Maria moved to Austin in 2010, and when I arrived in Austin in 2011, I appreciated having someone who spoke my native language to help me settle in. She understood and helped me through many of the struggles I encountered as a foreigner in a country with a culture that is so different than what I was accustomed to. When I asked Maria about having a guest post on gourmetcubicle, her eyes lit up, but then she shyly said no. It took some convincing to get Maria to agree to cook with me. She initially felt that none of her recipes were special enough, which is hardly the truth. She’s an extraordinary cook. When Maria brings me her homemade Hungarian dishes, I always finish them in one sitting. Not only is her cooking phenomenal, but Maria always seems to know when I need some home cooking. I remember that when I got back from Cambodia last year, a bowl of stuffed cabbage rolls was waiting in the refrigerator with a note that said: “Merry Christmas and a Happy New Year! Enjoy the cabbage rolls. The sour cream is on the top shelf.” Every year on the first of January, Maria invites me over to eat Hungarian lentil stew. It’s a tradition in Hungary to serve lentils at the beginning of the New Year as they symbolize prosperity and wealth. Maria is creative and artistic both inside and outside the kitchen. Right now she’s organizing her wedding, and she does it with so much calmness and grace that I wonder why this isn’t her full-time job. She’s designing everything from the invitations and decorations to the flowers and gifts. Everything is handmade with a touch of her own good taste. She and my other good friend Monika are creating things that are worthy of an Etsy editor pick. I hope they’ll start their own business sometime soon because the world could benefit from their creative talent. But back to Maria’s cooking. She eventually agreed to share a recipe with me. She showed me how to make snow crescents, called hókifli in Hungarian. These tasty desserts were Maria’s grandmother’s specialty. Maria regaled me with stories of her grandma as we cooked together. She told me how her grandmother always made hókiflis, how they always turned out perfectly, and how they became her favorite childhood dessert. I hadn’t tried too many snow crescents during my childhood because my grandma made other desserts (like Zserbó Cake (Gerbaud Cake)), but once I tried them at Maria’s, I instantly fell in love with them. They are not too sweet and not too heavy on filling. They are a tasty treat on their own, but eating them with your coffee will make you think you’re in a nice little café somewhere in Europe. Enjoy! In a medium bowl combine flour, sugar and baking soda. Using a whisk mix until well combined. Using your hands, crumble the butter into the flour. Make sure there aren't any large chunks of butter in the mixture. Slowly add milk and start kneading. Knead for about 5 minutes, sprinkling the dough with flour if it's too wet. Knead until the dough doesn't stick to the walls of the bowl. When done, cut the dough in half and shape each half into a softball-sized sphere. Sprinkle with flour, cover with plastic wrap and let them rest in the refrigerator for 15-30 minutes. Meanwhile in a medium sized bowl whisk walnuts, sugar, lemon zest and rum together until they reach the consistency of thick paste. Don't be shy; add more rum until the filling holds together. Sprinkle flour on a flat surface and lay a dough ball in the middle. Using your hands, flatten the dough ball into a disk shape. Use a rolling to pin roll it until it's about 1/5 inches thick. Using a pizza cutter or a sharp knife, slice the rolled dough into 12 slices. Repeat for the other dough ball. Add a teaspoon of filling to the wide end of each slice. Roll the slices from the outside towards the inside (from the wide end towards the narrow end). They should look like mini-croissants or crescents. Repeat steps 6-8 for the other dough ball. Grease a cookie sheet with butter and place crescents on it. Put them in the oven and bake for 17 minutes. Remove from oven when they start browning at the edges (the rest should be white). Set snow crescents aside and let them cool for one minute. Roll each snow crescent in the powdered sugar mix (they should still be hot when you do this). They break easily, so handle them gently. Serve alone or with coffee. To make homemade vanilla sugar, fill a mason jar with sugar, about 3/4 full. Cut a vanilla bean pod in half lengthwise and place both halves in the jar. Close the lid and shake vigorously. Let it rest for a bit et voilà, you've got yourself vanilla sugar! The longer you you rest the mixture the more intense the vanilla flavor will be. Refill the jar with fresh sugar every time you're running low. If you overcook the crescents a bit, don't worry. They will still be pretty good, but more crumbly. I personally prefer them moist, but if you want them crumbly, cook for 20 minutes instead of 17. Keep leftover crescents in a sealed Ziploc bag. This will keep them from drying out.